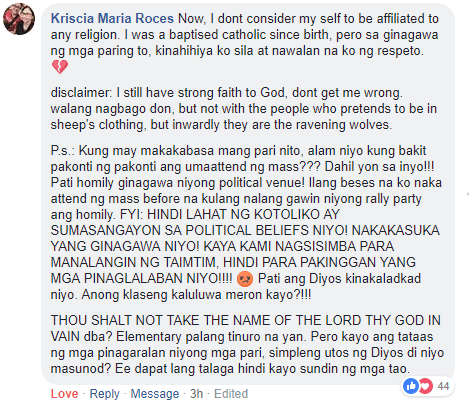 Kriscia Maria Roces has had it with Catholic priests who conduct masses but make their homilies about the political issues that are happening in the country. She posted on Facebook via comment her thoughts on the matter. According to Roces, she is a firm believer in God and still abides by the beliefs of the Catholic Church, however, with the stories that have come out about Catholic priests and the abuses they do towards children, she says that she has lost respect towards these priests and have lost trust towards them as well. She adds that while she, and many others still believe in God, she thinks that the reason why there is a declining population of church goers is specifically because of these abuses and how there are so many of these cases that have been brought to life already. More than that, she says that the priests should respect that many people may not share the same belief with these priests so they should not use the homilies to share their political beliefs. 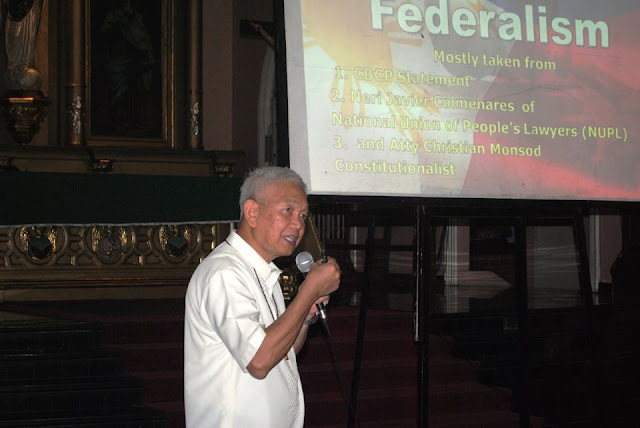 "FYI: HINDI LAHAT NG KATOLIKO AY SUMASANGAYON SA POLITICAL BELIEFS NIYO! NAKAKASUKA YANG GINAGAWA NIYO! KAYA KAMI NAGSISIMBA PARA MANALANGIN NG TAIMTIM, HINDI PARA PAKINGGAN YANG MGA PINAGLALABAN NIYO!!!!" she said. She says that people go to church to reconnect with their God, and not to listen to the plights of these priests. Continuing on, she says that the Lord should not be dragged into the personal agenda of these priests and that they should just concentrate on teaching their flock about what the Lord is saying. Ending her post, Roces says that what these priests are doing are taking the name of the Lord in vain and this is something that definitely should not be done, as it is taught as early as elementary school. "THOU SHALT NOT TAKE THE NAME OF THE LORD THY GOD IN VAIN diba? Elementary palang tinuro na yan. Pero kayo ang tataas ng mga pinagaralan niyong mga pari, simpleng utos ng Diyos di niyo masunod? Ee dapat lang talaga hindi kayo sundin ng mga tao,” she said. “Now, I dont consider my self to be affiliated to any religion. I was baptised catholic since birth, pero sa ginagawa ng mga paring to, kinakahiya ko sila at nawalan na ako ng respeto. disclaimer: I still have strong faith to God, dont get me wrong. walang nagbago don, but not with the people who pretends to be in sheep’s clothing, but inwardly they are the ravening wolves. P.s. 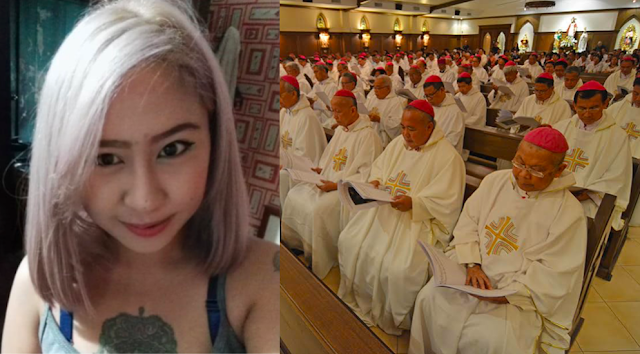 : Kung may makakabasa mang pari nito, alam niyo kung bakit pakonti ng pakonti ang umaattend ng mass??? Dahil yon sa inyo!!! Pati homily ginagawa niyong political venue! Ilang beses na ko naka attend ng mass before na kulang nalang gawin niyong rally party ang homily. FYI: HINDI LAHAT NG KATOLIKO AY SUMASANGAYON SA POLITICAL BELIEFS NIYO! NAKAKASUKA YANG GINAGAWA NIYO! KAYA KAMI NAGSISIMBA PARA MANALANGIN NG TAIMTIM, HINDI PARA PAKINGGAN YANG MGA PINAGLALABAN NIYO!!!! Pati ang Diyos kinakaladkad niyo. Anong klaseng kaluluwa meron kayo?!! !